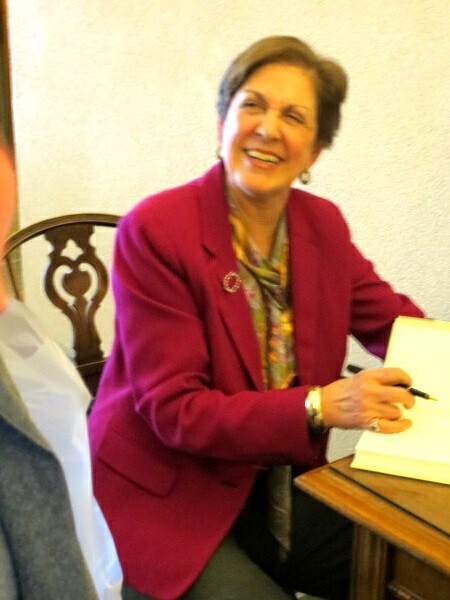 On Saturday, in a quiet theater room away from the busy Camellia Show at Tower Hill Botanic Garden in Boylston, Massachusetts, Barbara Paul Robinson shared her memories of Rosemary Verey whom she referred to as “my teacher, mentor, and friend.” Barbara is a partner in the law firm Debevoise & Plimpton in Manhattan. 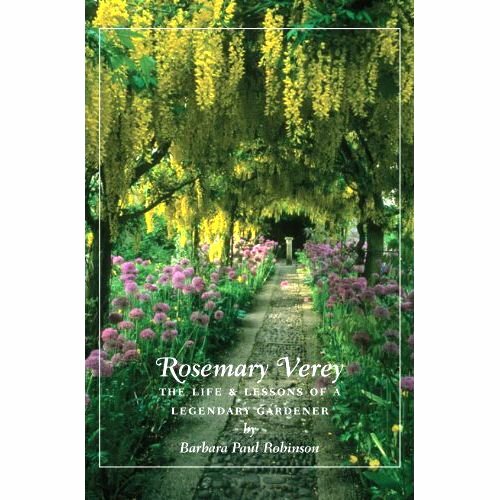 She took a sabbatical to write this biography of Rosemary Verey, the first book written about Verey since her death in 2001. So who was Rosemary Verey? Until this book, I didn’t know about her, but she is quite renowned in the gardening world. 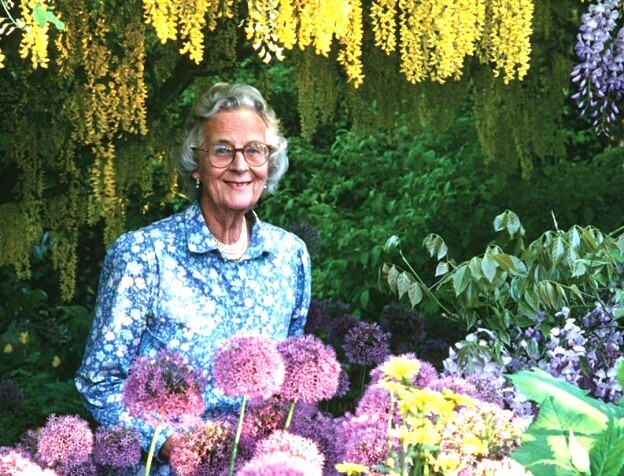 She was a self-taught garden landscape designer famous for her laburnum walk at her garden at Barnsley House, in the Cotswolds. The image has appeared in many calendars, magazines, and books; Barbara uses it on the cover of this biography. Rosemary Verey came to gardening late in life and, in fact, had no interest when her husband’s parents gave them Barnsley House in 1951. What gardens there were she had grassed over so her four kids had more room to play. Also, in post war Britain it was hard to find people to maintain the large gardens. Around 1960, her husband, David, an architectural historian, decided to build a garden and wanted to consult with Percy Cane, a horticultural writer and garden designer. It’s at that point that Verey decided she wanted to design the garden herself and spent the 1960′s learning all she could about plants and gardens. Having studied maths and economics at London University before she married, she was able to apply her mathematical ability to garden design. 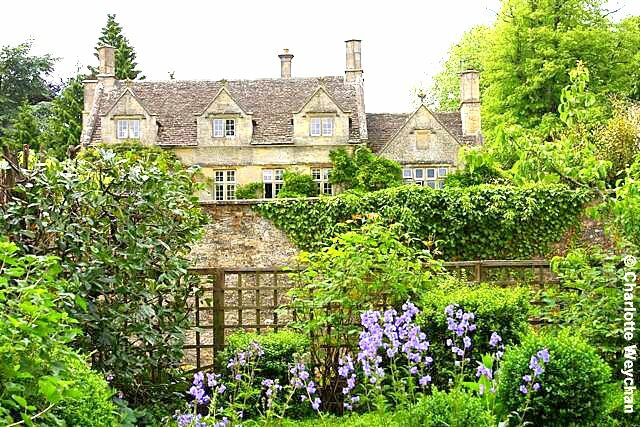 Since Barnsley House sits on only four acres, Verey adapted what she read or saw of large estate gardens in the Arts and Crafts style of the Edwardian-era to fit in a much smaller space. And this is what made Verey’s ideas accessible to the garden loving public. Although she came from an aristocratic background, she was very down-to-earth and practical and explained ideas in such a way that others felt they could emulate what she had done. When she opened her Barnsley House garden in 1970 to the public, I’m not sure she expected it to be as popular as it was. Over 30,000 people a year visited her garden until her death in 2001. 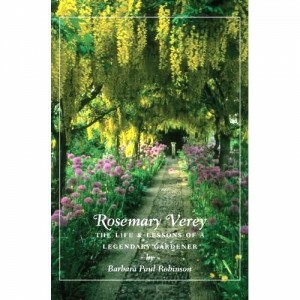 Verey wrote her first book at age 62, The Englishwoman’s Garden, in 1980. She went on to write over twenty more books, most notably The Art of Planting and The American Man’s Garden. Her most influential garden was the potager, a kitchen garden adapted from the one at the Chateau de Villandry in the Loire Valley in France. The sections of the garden are enclosed by clipped boxwood. In Wilmington, Delaware, the Sanford Garden is one of Verey’s potager gardens. Stairs allow you descend into the garden and appreciate the geometric design from above as well as views of the unspoiled landscape in the distance. 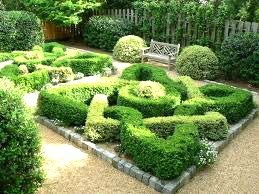 In her book Classic Garden Design, she described how to recreate garden features of the past, such as knot gardens with sundials and statuary. Through research, she discovered that the knots were ribbons of boxwood that wove over and under each other to create more interesting patterns than we traditionally associate with knot gardens. In this way, she brought new life to a centuries old idea. She also was very innovative in her ideas about gardens in winter, which she discussed in her book The Garden in Winter. She felt a garden should look wonderful no matter the season, taking advantage of the form and color of evergreen and deciduous shrubs and plants in the winter landscape as well as stone structures, concentrating on design rather than flowers. Although she had her own ideas for gardens, she was not averse to copying other’s ideas and advised Barbara ”to always carry a notebook” to capture those ideas. In 1984, her husband died, leaving her with a mass of debt. So she was compelled to keep working, which was fortunate for the gardening world. She continued to write books and design gardens. After visiting the U.S., she wrote The American Woman’s Garden and came several times a year thereafter to lecture and fulfill garden commissions. Helen Mirren, who was in the movie Greenfingers (2000) about a gardening competition, met Verey and said she was the most intimidating person she had ever met. Given Mirren’s personality, that’s saying something! At her garden at Barnsley House, the borders were densely planted in mostly soft tone plants such as alliums, geraniums, campanulas, clematis, and aquilegia. Barbara noted that Verey believed in “planting in layers” so the garden would look beautiful all season long. To do this, she ripped out plants when they were done blooming replacing them with others that would soon be in bloom. She would do this several times each season – editing and selecting – until her vision was complete. This to me was very reminiscent of Gertrude Jekyll who pioneered and advanced the idea of the cottage garden on a grand scale. However, Jekyll lived in the Victorian and Edwardian eras when there was plenty of inexpensive labor to fulfill her vision. Because of the time and expense required to maintain the gardens, many Verey gardens have suffered a similar fate as the Jekyll gardens, falling into disrepair or being scaled back considerably. Unfortunately, Verey left no provisions for continuing her garden at Barnsley House. It’s had an up and down history since then and is currently a luxury hotel that is trying to revive the garden – an ornamental vegetable garden and potager. Two of Verey’s most famous clients became friends of hers – Prince Charles, whose home Highgrove is near Barnsley House, and Elton John. Prince Charles, who commissioned her to design some of the gardens at Highgrove, helped secure an OBE (Order of the British Empire) for her. 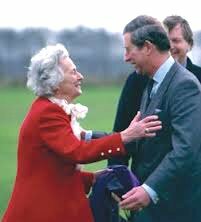 Barbara said that although Verey and Prince Charles had a falling out for time, they became friends again before her death. Elton John, the flamboyant entertainer, appealed to Verey’s sense of fun. Apparently, she loved a good party and was often the last to leave, according to Barbara. It’s not something you would guess of a woman who with her pearls, floral dresses, and coiffed hair looks every bit the proper English lady that she was. She smoked and enjoyed her drink, but not to excess. She even had an affair in the seventies with an architect who may have had an influence on her gardens at Barnsley House. Barbara, who worked for Verey for a month as an apprentice in the early 1990′s, said that while she could be charming, she was also very opinionated and did not hesitate to make her views known. You did not cross her lightly. You can see Verey with Elton John touring the gardens she created for him on YouTube’s Elton John’s Gardens with Rosemary Verey that was filmed in 1996. So what is Rosemary Verey’s legacy? Her designs are traditional and are in stark contrast to those of Modernist designers such as Dan Pearson and Christopher Bradley-Hole who became popular in the nineties. The fact is trends come and go and they each leave their mark and influence on those that follow. And I think that’s where Rosemary Verey stands. She brought the Arts and Crafts style garden of the Edwardian-era into the modern age, adding her own ideas along the way and making it something gardeners everywhere felt they could emulate and make their own. 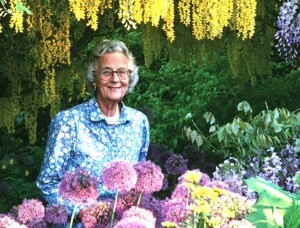 Her books and garden designs will continue to inspire and move garden design forward, constantly changing and evolving. Given Verey’s strong character, personality, and verve, I’m sure she wouldn’t have it any other way. I look forward to reading Barbara Paul Robinson’s book and learning more about this fascinating garden designer and personality.